We fly to Dallas to see Brandon and Amy. Tuesday or Wed. we are going to drive to Southeast Missouri to see Darla's Family. On Sunday we go up to St. Louis and fly to North Carolina to visit my folks. Thanks for your prayers as we are traveling. OK I'll be honest it's hard to sing "I'm dreaming of a white Christmas" with any conviction when your backyard garden is in full bloom. But it is looking like Christmas inside the house. We even had a visit from Santa and his Dog. We started about two years ago with a group of medical students from Ga. We did a one day medical clinic at the school in the village of Chan Chen. We discovered that the needs were great. I met the town leader that day his name is Rodolfo, I ask him what we could do to serve his village and he jokingly said “you can paint our jail” so we did. For almost two years now we have been bringing food and clothing out to these people and they are always glad to see us but the only thing that has changed in these two years is that now there are even more poor people in the village and the jail needs another coat of paint. So I have been talking to the leaders trying to understand the source of the poverty and how we can really make a difference. We have come up with a plan that will be the first step in meeting the real needs in the village of Chan Chen. Poverty is the great problem we face in Chan Chen and I know that there are many reasons behind this problem. The lack of Education, alcoholism, self-serving leadership, no telephone service……etc. The greatest cause or perhaps the septum of the problem of this poverty is the flight of the men. 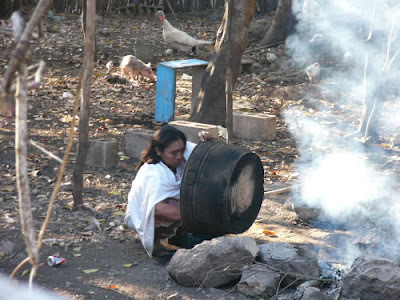 The men can not find jobs in the village so they move to the tourist area of Playa Del Carmen, or Cancun in search of work to feed their family. When they arrive in the tourist zone with no English and very little Spanish they can only find the lowest paying jobs and cost of living in the tourist zone is 10 time higher than life in Chan Chen. Most have no money to send home and many men never return home. Many of the women are left in the valley with no way to feed their family. Bring economic opportunities to the village. Prepare and train the work force. Offer an on going celebration recovering class. Bring cell phone service to the area. CHRIST LOVE IN ACTION! Rodolfo and his family have donated land to our organization, Global Community Fellowship, to build a small mission center/hotel. This land is in an ideal location for what we want to do it is located on the main road just before you come into town. This is a great place with many large trees and room to build. We plan to build six Mayan huts or cabanas, a kitchen and meeting area. The cabanas will look like a traditional Mayan house on the outside but will be a modern hotel room on the inside. Estimated building cost. Each cabana will cost about $11,000. The kitchen and restaurant/meeting area estimated building cost $16,000. That would be the total building cost would be about $82,000. If we can bring down 70 mission volunteer a year to stay at the Mayan hotel then we will be able to employ 10 Mayan workers full time… This would mean that about 50 more children would have a father in the home and food on the table. This is the first direct benefit. We would also plan to train young people who are planning to leave the village for work in the Tourist zone. Our volunteers will help teach English and we will also help the students find better paying jobs. The third benefit to the families of Chan Chen is that we will help train the women in developing and marketing hand make craft. As we build relationships and give people hope for the future we will share the Good News of Christ. IN 2009 We need construction teams to stay and work along side the Mayan workers. We need medical teams willing to come and stay in village Hotel and conduct medical clinics in and around Chan Chen. We need sports team willing to come and do sports camp in the park at Chan Chen. We need teams to come and do mission VBS in the park. We need teams show the Jesus film in Mayan in Chan Chen and other near by towns. WE need a video team that would come down and do a 10 minute high quality video to help promote the project. We need a volunteer to build high quality professional Website for the Chan Chen missions Hotel project. We need help from a stateside volunteer to help us write professional ads for Baptist State papers. We need help from a stateside volunteer to promote this project to University students in the states. We need stateside volunteer that would help us find a used van or truck in the states that is in good condition that we could use in ministry in the village. We need two English teaches willing to come for two months and stay in the village and work through the school in Chan Chen as a volunteer teacher. We need volunteers that would help us raise money stateside and promote this in the churches in your area. WE need volunteers that would pray and keep our prayer needs before your church. Rodolfo is our director of construction in the village. We are going to build as we have the money. We are paying Rodolfo as we go. For example cleaning the land is taking four men two weeks at a cost to us of $150. We are paying Rodolfo $40 a week to work for us full time. We are going pay for the jobs as they come. After the hotel is completed Rodolfo and his wife will manage the hotel and a cost of $200 per month. The volunteers will send their money through Global Community Fellowship and we will pay the hotel cost. Rodolfo will hire the staff to run the hotel….. We will all work together as we get started. The cost of the mission trip will very based on the number of people on the team and the number of nights spent in the tourist area hotels. Cost will change but for now I am thinking about $600 per person for a week. This is how the money is going flow out monthly. God is at work in the Mayan Village of Chan Chen. Today the family that owns much of the land in around the small Mayan Village of Chan Chen responded to the call of God as I shared the vision for the work in Chan Chen. After hearing the plan they said "your vision is to large for the land you have but don't worry we have 4 acres on the east side of village you can have." This was a God thing because I knew the land that I had would not work but I did not know what God was going to do. I felt like Abraham walking up the mountain with his son not knowing how God was going to work it a;; out but trusting that He would. Below is a Photo of the family that God used today to answer many prayers. The future home of Chan Chen Mission Center. WE NEED YOUR HELP AS WE ARE RAISING FUNDS FOR THE PROJECT. A few dollars can go a long way out there. Our pastor of worship Danny takes handing out to a new creative level. I was out in the small Mayan Village of Chan Chen this week and had a great time sharing and planing with the community leaders. There are many needs in this poor village. Your heart would break to see how some of these people are just surviving on almost nothing. For almost two years now I have been bringing food and clothing out to these people and they are always glad to see us but the only thing that has changed in these two years is that now there are even more poor people in the village. So I have been talking to the leaders trying to understand the source of the poverty and how we can really make a difference. Maybe this is over simplifying the problem but there are no jobs in the village so the men move out to tourist zone or the US in search of work to feed the family. When they move if they do find work it is often the lowest paying jobs and they also discover that the cost of living in the tourist towns is very high. Most will have very little if any money to send back to the family in the village. The separation is hard on the family and many of the men never return to the village and the kids and women are there living on our handouts. It is easy to get overwhelmed in the face of a giant problem like poverty. It is true that we can not to everything but we can to something. This is my dream, to help create an opportunity for some men to have paying jobs in the village and those who choose to leave be better trained so they could find the better jobs in the tourist zone. I want to start by building a small mission center hotel in the village to house volunteer teams. If we can bring four teams a year that will mean that 6 Mayan families will be able to stay together. The small hotel could employ as many as 10 men . That would mean that about 50 children would now have a father in the home and money to support the family. This center would also be a training center teaching English and the other skills needed to find the higher paying jobs if they decide to leave the village. I believe this mission center will show the love of Christ and many will come to Salvation. I want to build 6 units and each unit will cost about $11.000. If you have ever tried to learn Spanish you will love this... "First Semester of Spanish love Song"